How to Use 303 Tire & Rubber Cleaner | Gold Eagle Co. Your tires tend to be among the dirtiest parts of any car, which is no surprise since they’re constantly touching the ground. But that doesn’t mean you have to just deal with unsightly grime and dirt all over your tires. And if you plan on showcasing your car in any shows, you definitely don’t want your tires to be covered in dirt. Fortunately, there’s an easy way to make them look new and clean again: 303 Tire & Rubber Cleaner. This formula is perfect for cleaning not only tires, but also any other rubber and vinyl surfaces. Here’s why you should use this product, and how to use it the right way when you clean your car. 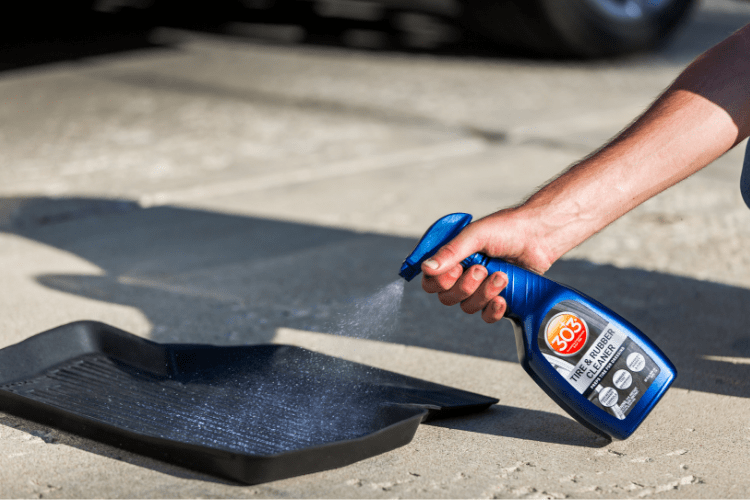 Why Should You Use Tire & Rubber Cleaner? Whether you have a classic or muscle car that you plan on showing off this summer, or just enjoy keeping your vehicle looking spotless inside and out, you’ll appreciate what 303 Tire & Rubber Cleaner can do for your tires. Basically, if you don’t like seeing dirt, grime, or tire browning in general, all you have to do is apply this product to your tires to get them looking cleaner than you thought possible. Plus, this product even works for cleaning your wheels, allowing you to get them free of dirt and shine them up as you clean your tires. And if you have rubber floor mats or any other rubber or vinyl surfaces in your car, 303 Tire & Rubber Cleaner will get them clean within minutes! Cleaning your tires with Tire & Rubber Cleaner is easy. Just spray it on the surface and watch the purple foam start to turn brown as it removes the dirt and grime from the rubber. Feel free to sit and watch it change colors for one to two minutes while it pulls the dirt out of your tires. Then take a Tire Brush and start scrubbing the surface with it to quickly remove any stubborn grime that didn’t come off from the cleaning solution alone. After rinsing, scrub again ith the brush and rinse. Repeat the process until the foam on the tire is white. The next step is to rinse your tires with water and then dry them. And that’s all it takes to get your tires looking practically spotless! If you want to make your tires look not just clean, but practically brand new, you should apply 303 Tire Balm and Protectant after you use the Tire & Rubber Cleaner. 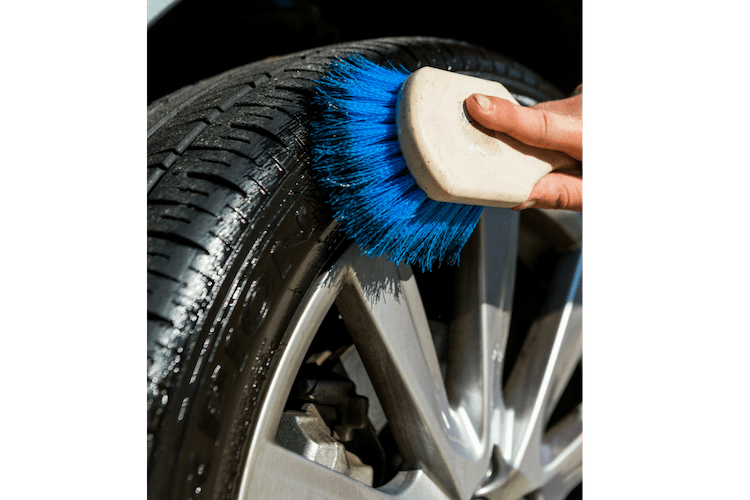 When you follow up the cleaning process with this product, you can give your tires either a matte or gloss finish—depending on how many coats you apply—and also protect your tires from the dreaded dry rot. In fact, if you’re interested in getting your tires looking their best, you can get the 303 Tire Care Bundle, which features both of these tire cleaning products and the applicators you need to apply them. You’ll especially want this bundle if you want to show off your ride at a car show, since everything—right down to the tires and wheels!—will be expected to look topnotch. And don’t forget to use 303 Tire & Rubber Cleaner on your rubber floor mats and any other rubber or vinyl parts in your car!